I love this TedX video. Thanks Dr John Reid for sharing it. There are so many insights into Animism such as how the indigenous view the world, how an object may view us and how society can relate to the world around it better. Dr John talks about indigenous cultures and how one of the key attributes of Animism is to see that mountains, rivers and lakes and other things as family members. They see personas and people in the world around them and they don’t just believe it, they experience it always. Most people don’t understand this concept but if you think of the way you relate to your pets as being a member of your family, Animists relate the same way to plants, the land, the sky and everything. Some family members they know well , like the mood of a local mountain. Others not so well, like a mountain in another land. Have you every thought… just because something cannot express itself with personality like a dog does, doesn’t mean it doesn’t have a personality. For me this aspect is personal. I remember my mum having parkinson’s disease and how she lost the ability to communicate. It was very sad because she was a highly communicative person and I felt for her not being able to express herself. But did this make her not a person? No, we just couldn’t relate to how much she did or didn’t understand, and she was not able to express herself so we could understand how she felt. She still had a persona, but just wasn’t able to express it. Does your dog, cat or baby wish it could express itself better so that you can understand what it wants or is thinking? If you consider that a rock, plant, insect or animal is basically made up of the same “stuff” that we are (particle, elements, water, etc..), it follows the same line of thinking. We never know how much they do or don’t understand and for most, we are unable to understand how to listen to them. Back to the video, I really enjoy the way he describes the family tree and that “everything is your cousin” because when you dissolve our bodies back into the elements, or consider how we have evolved, it’s all related and is one and the same. We are all related and that is why it is easy for us to relate to our animals. In the second part of the video John then goes on to talk about the “Mana” of a person, or the dignity of an object. For example, by polluting a river and limiting its ability to provide affects the dignity of the river. We can learn from this by looking at things as who they are, not what they are. How can they ocean cycle water if we pollute it? How can the forest give us air if we destroy it? Can we treat things better if we consider them as a person? The indigenous, they understand respect. They understand preservation. They understand sustainability whereas today’s society looks at everything as resources that can be taken, consumed and sold for a price. Sad…. On a positive note, it is fantastic how he and others have found a way to unite Animism with the people, but drawing connections between objects such as perfume and stones, to the source of the animistic community. That way when you buy a souvenir, you buy into the story and can engage deeper with the land. I have always thought myself as indigenous. I may not have heritage in this land but i was born here, in this land, in amongst the hills, rivers and oceans. I share that with the aboriginals and it’s something that both indigenous and other cultures need to consider. If you are interested to view another indigenous animistic video, look at the world through the eyes of someone who has lived Animistically and has not only felt the effect of man’s actions, but has done something about it. The video is below. “We live because we have the forest”. How cool is that! If your partner, co-worker or friend hasn’t let you know yet, Konmari, a method for tidying up your life and home, is the latest sensation, Netflix hit and book series resonating around the globe. But, what many people won’t understand is why she does what she does, and that is Animism. The show is a reality show where Marie Kondo enters a home in disarray and uses her “innovative Konmari method to help people clear out their clutter and choose joy”. The show “demonstrates the life-changing magic of tidying up, as Marie transforms her clients’ lives in emotional and surprising ways”. When you watch the show you will notice Marie greeting the house, sensing the room, looking for the spark of joy in objects and saying thank you for objects that will soon be discarded. For many this is strange. For me it is not. It is an animistic form of respect for everything in the home that you engage with and is influenced by the fact that the Japanese are a highly animistic culture. Animism is the belief that everything (objects, places and creatures) all possess a distinct spiritual essence or a soul. The basics of animism exist in Shinto and can be referenced in Kami which refers to the divinity, or sacred essence, that manifests in multiple forms e.g. rocks, trees, rivers, animals, places, and even people. In the show, she treats everything in the home including the home itself as a living entity that deserves respect. The beauty of what she is doing is presenting it in a cute and gentle way that the participants and viewers are not rejecting. She is also adding joy which is not a typical thought in traditional animism. I really like how she asks the participants if an object “sparks joy”. What a great ideal. A happy or surprised Jaguar? What Marie does is connect the joy of an object to someone’s feelings in the same way you choose a car by the way it looks. Connecting to objects is very unique when tidying a house but very common across society when choosing cars or being attached to things. Most people just don’t think of it that way. The key to her success and results is by teaching people to surround themselves with things that make them happy, which is not unlike a entrepreneur being told to surround themselves with successful people. As an animist, I totally subscribe to this thinking. After watching my first show on the bus to work early one morning, I entered the office before anyone else had arrived. So I spent the next 15 minutes walking around the office, talking to the rooms, plants and objects, and sensing its presence. I have to say, I believe it’s a happy office. The final piece of her puzzle is everything having a home. If an object in your house has a home, it’s easy to find it’s way back there. This concept is not just animistic, it’s practical and logical, and this is what ties up her ideals into a fabulous methodology. As a final thought, the other day I went and watched the movie Mary Poppins Returns with my wife. I have to say, musicals are not my joy but there was one thing that resonated and that was the song “The Place Where Lost Things Go“. This to me is the opposite of this blog and that is, for everything that has a home, in our modern day disposable society, there is so much more that is lost. I think I will save that line of thought for another post. References used: Konmari website. Wikipedia Shinto. So why have I updated my website after all this time? In the past I have Stuart Meyers on Facebook and Twitter, CyclingBTD when I was heavy into cycling, AllThingsHost from my previous employ and GeorgeTMaxwell / UniversalDint / ParticleAnimism / PersonifiedUniverse from my writing. Add Slide Racing, Natural Revenge and my current employ and it’s a whole lot of confusing identities. So 2019 is a refresh. 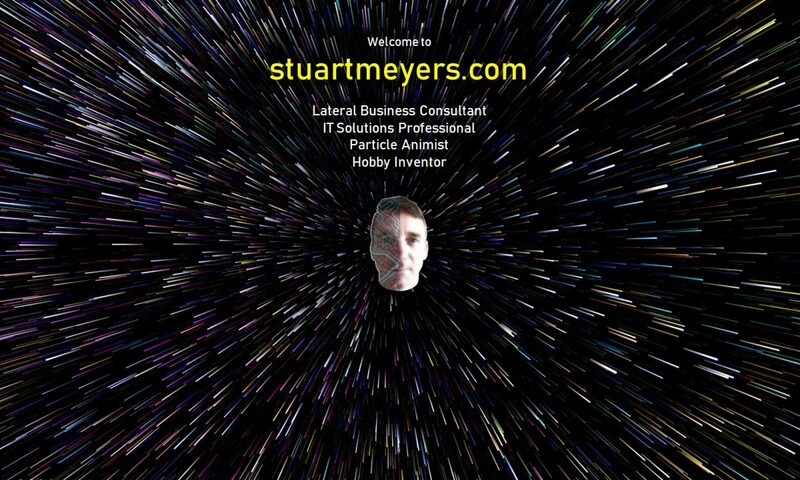 StuartMeyers.com is now a consolidated view and single identity with purpose. It’s a culmination of everything I am and a baseline to drive forward. This is me. I like thinking a lot, professionally engaging, being challenged, solving problems interactively and creating stuff. Plus, I am underpinned by a spiritualist view of the universe where everything is alive and has a desire to experience. Today, the world is accepting and embracing diversity so I don’t have to compartmentalise my life. My current role at Objective has helped change my job into a career and opened up a world of thought and new direction. It has inspired me to share my skills and experience and given me an understanding where I want to be while I continue doing what I enjoy now. And that really sums it up. Someone I met on the path. I have a daughter and like so many others of this generation, she needs help to be able to engage in today’s society. I also have a business idea on how to leverage the intellectual skills she (and similar people) has that may be able to accommodate and support her challenges. But I haven’t quite worked out how to bring the two together. So stay tuned and ask me about Project #5 if you are interested.